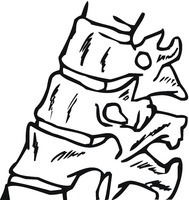 1 Vertebrates are all animals that have a backbone. Vertebrates are in the phylum Chordata. Chordates (or vertebrates) have internal skeletons called endoskeletons made of bone or cartilage. They each have a nerve cord that runs down their backs, known as a central nervous system. They have specialized body systems for the jobs of digestion, circulation, and respiration. The Chordata phylum is further divided into five classes. These five classes are fish, amphibians, reptiles, birds, and mammals. 2 Fish (including sharks) make up the largest group of vertebrates. Nearly half of all vertebrates are fish. Fish have been swimming in Earth's water for more than five hundred million years- longer than any other kind of vertebrate has been on Earth. Fish are ectothermic animals, which means that they cannot control their body temperature internally. If they get cold, they move into warmer water. If they get too warm, they go into deeper water. We say they are "cold-blooded." Fish live in water. Fish have fins which are structures used for moving. Most fish get oxygen through gills and have scales as a body covering. Scales are thin, overlapping plates that cover the skin of fish. They are made of a hard substance like your fingernails. Fish have skeletons of bone or cartilage. Their circulatory system features a two-chambered heart. Most fish lay jelly-like eggs in water to reproduce. 3 Amphibians (frogs, toad, and salamanders) are also cold-blooded, ectothermic animals. Their name comes from a word that means "double life." This refers to their life cycle that is partly spent in the water, breathing with gills, and partly spent on land, breathing with lungs. Most amphibians lay jelly-like eggs in water. The larvae that hatch swim and have gills for breathing. As they undergo metamorphosis and become adults, most amphibians acquire lungs and lose their gills. Adult amphibians also get oxygen through their thin, moist skin. They do not have scales. Their circulatory system uses a three-chambered heart. Amphibians were the first vertebrates to live on land.